Traditional sandblasted signs are beautiful, but expensive in the long run. Sandblasted signs used to be made of old-growth redwood because the 100+ year old wood had a beautiful spaced grain pattern that blasted well, leaving a contrast between the wood grain texture and the raised graphics. They stopped the harvesting of old-growth redwood a few decades ago, which lead sign manufacturers to come up with an alternative solution, one of which was cedar. The more recent was HDU (High Density Urethane). • Cedar Sandblasted Sign – while similar in color as redwood, the grain pattern is tighter and doesn’t blast as well. Cedar is harvested young, and the seasonal expansion and contraction damages the finish. Regardless of what you are told, there is no commercial primer or topcoat finish that can withstand wood expanding or contracting. This means that just like the exterior of a wood house, a wooden sandblasted sign will have to be repaired and refinished every few years. • HDU (High Density Urethane) Sandblasted Sign – this is a synthetic wood material that does not expand or contract, meaning the primer and top surface coats will stay intact for the longevity of the paint manufacturer’s specifications. HDU is an open-cell foam, without grain for structural support. HDU does last, and a faux wood grain pattern can be blasted into it, but there is a structural issue. You can walk up to HDU sandblasted signs and snap them into two pieces (on post application). There are other factors to take into consideration. Let’s say your sign is 25 feet off the street and traffic is going by at 30 mph, or if you sign is located above your entry door on the facade. • Do you think viewers will see the dimensional effects of the sandblasting? • Is it worth the added expense for the sandblasted signs relief (3-D depth)? Our experience in the field is that it is not worth the added costs of dimensional relief by sandblasting when looking at ROI (Return On Investment) when taking into consideration the maintenance costs and lack of distance visibility. As with any technology, times change. We offer the ability to computer graphic design a sandblasted sign “look” that can be directly applied to a lifetime, maintenance-free product (such as sheet aluminum). It looks like a sandblasted sign with dimensional effects, but at half the cost. 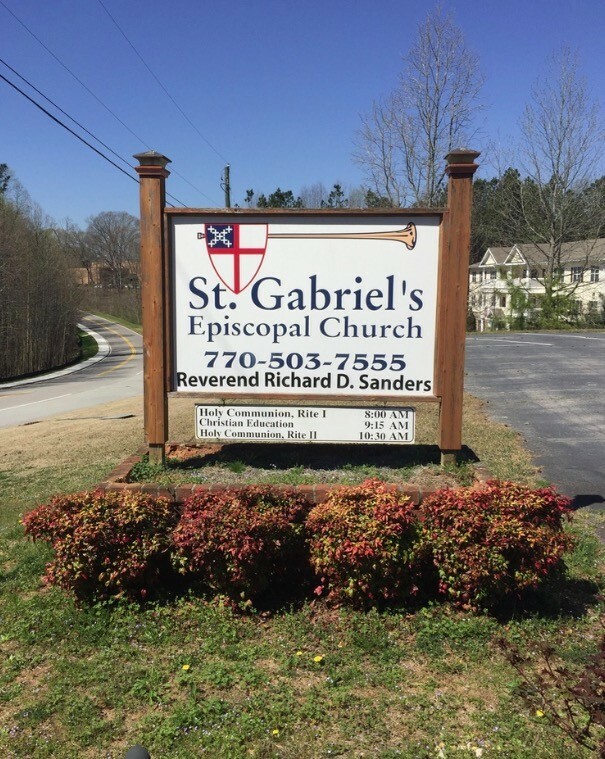 Saint Gabriel’s Church aluminum sign panel to look like sandblasted signs, with changeable service hours and pastor name. As you can see, a little painting and minimal costs on new graphics makes this church look like new. Contact our sales team with photography of your project and let us make a recommendation. 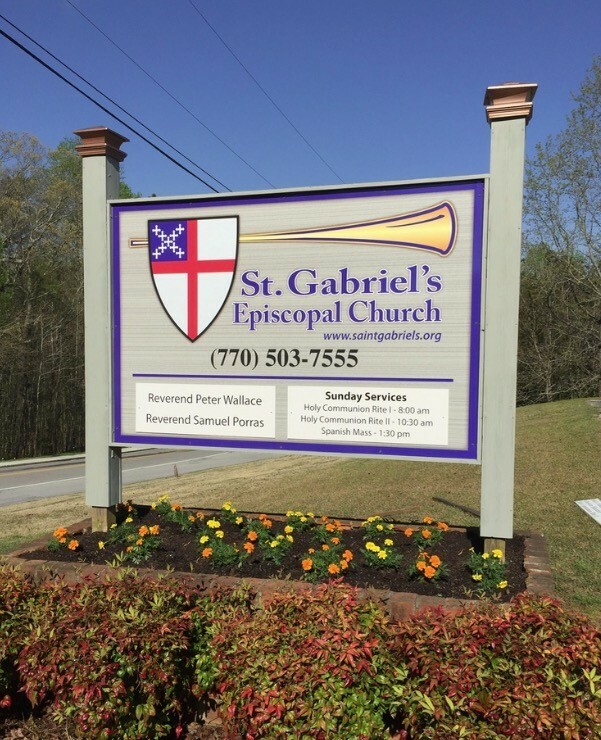 This entry was posted in Business Signs, Church Signs, Commercial Signs, Completed Sign Projects, Monument Signs, Property Developer Signs, Sign Design by BSM Staff. Bookmark the permalink.